I have recently started infusing sprits to make flavoured liqueurs. I decided that I should make the bottles match the new flavours in some way, with most this will only require some simple glass etching (using my fantastic Dremel, Thank you Instructables!). Currently however I have a ginger infused vodka maturing in a cold dark place, I could not think of a cool way to represent this on the bottle, but for some reason the blend brings Dragons to mind. Rather than etching Dragons onto the bottle I thought I would make a bottle that looks like it is wrapped in dragon skin. I looked but couldn't find an 'ible to do this so decided to try it myself and write one along the way, and so here we are. As always Duck tape was the first material that came to mind, its waterproof, hard wearing, self adhesive (obviously) and can easily be made to look like "leather" scales. Makes the bottle easier to clean without the sleeve. Can be easily re-used or moved onto another bottle of the same shape. Can be removed when chilling to allow for quicker cooling. If you would rather not make it removable you can skip Step 1. Whilst I've not tested it, I think the sleeve could act as an insulator to keep the contents cool after chilling and should act as a protective coat against small knocks. I had read "Bouquet of Duck Tape Roses" by poptart7 some time ago and my 'ible uses the same technique to make the scales as they do to make the petals, so you may want to check that out too for another description of the technique, plus it is a good 'ible and well for a look on its own merits. I hope you enjoy this Instructable and will both forgive and let me know of any spelling or grammar errors you see, also let me know if anything isn't clear. As I mentioned at the end of Step 5, I was not 100% happy with final look of the cap, I felt it was lacking and looked unfinished, I have now added an embellishment which I feel goes someway to improving the final look. I have added an Alternate Method to the end of step 5 to show you what I did. You can see the new version in the in the photos here and more in the final step. Please let me know what you think about the new cap in the comments. A Bottle: Shape and size are up to you but be aware bulges and pinches could prevent the sleeve being removed. Most Smirnoff bottle for example would not be suitable as they have pinch near the base and widen as the go up, this will impede the sleeve being slid up and off. The Eristoff bottle I am using does have a pinch near the base below the bulge, however is near enough to the bottom that I can leave a loose skirt to allowing the cozy to be removed. Duct/Gaffa Tape: Use any colour you like, I used grey but would have used either red, green or orange, had they been more widely available in the UK. Note: You will be using a lot of tape, the roll shown was not full but covering this 70cl bottle used all the tape shown and small amount from another roll. Kinder Surprise Egg Canister: This is optional, it will be used to make a cover for the Cap, but if you would prefer not to do that step you can, if kinder eggs are not available where you are (I feel sorry for you) try using a larger cap form another bottle eg: mouth wash or deodorant, as long as if fits snugly or can be made to fit over the originally cap it will suffice, or you could just stick the scales straight to the original cap during this step. Craft Knife, Stanley Knife or Box Cutter: Most any knife will do, I am using a box cutter, you don't need to do any intricate cutting so as long as its sharp it will work. Cutting Mat: I'm using a standard green cutting mat, also I know the large squares drawn on it are 2" which is handy later. Optional and not Shown: A ruler or tape measure and a rubber band. Time: You will need a good few hours, this was the first one I made and I think it took about 4 hours. In order to make the cozy removable we will first wrap the bottle in tape but with the glue side facing out. A great part about this step is that you don't have to make it too neat or having it fit perfectly, mistakes will be covered up in the following steps. Start somewhere in the middle, the top and bottom should be the last places to be wrapped. ​Unfurl a length of tape lone enough to encircle the bottle with a small overlap, mark (I made a puncture with the knife) and cut. Keeping the glue side out wrap your tape around and stick at the overlap. Remember​ do not make it too tight. Repeat the last step, over lapping each ring of tape slightly with the previous one and tapping along the overlap with a fingertip to stick them together. Keep doing this until the all is covered apart from the sections nearest the top and bottom. Use narrower strips placed vertically and overlapping as required to cover areas where the shape and width change. To add the final rings of tape at the top and bottom, first cut a length of tape long enough to go around the top and base of the bottle, fold over about a half inch along the length glue side to glue side, to form a "Hem". Cut to the length needed to encircle the base and top, set in place as with the previous rings using over lap to stick ends together, another small piece of tape may be required to hold the hem overlap in place. Make sure the hem is to the bottom on the base and to the top near the cap, be sure the ring of tape at the base fits loosely. The tape must not cover any part of the cap. The hem will stop anything sticking to exposed tape glue at the base and should prevent drips of alcohol from delaminating the tape at the top. Finally slip the completed sleeve off the bottle to check it works, this is the time to fix any errors or tight places. Despite the number of photos, the scales are quick and easy to make, which is lucky as you will be making many, I think I used about 250 scales for mine. The scales are made of pieces of duct tape that should be roughly 2 inches square, this doesn't need exact. My tape is just under 2 inches wide and I know the large squares on my cutting mat are 2 inches square, so I gently stick lengths of tape too my cutting board, making sure not to push down to hard. Then following the lines of my board cut through all the lengths of tape to form squares, this way I can cut 32 squares at a time. Carefully peel of one of your squares off tape your cutting mat. Fold from one corner diagonally towards the opposing corner, glue side to glue side. DO NOT FOLD EXACTLY IN HALF! Leave about an 8th of an inch of glue exposed along two edges. Taking one of the two corners on the new folded edge, again fold toward the opposing corner, not all the way, leave a singe strip of exposed glue at the top. You should now have a triangular scale with a strip on glue along one edge, ready to be stuck to the tape sleeve, as shown in the next step. I made my scales one at a time as I went, make and stick, make and stick, a few hundred times. Step 4: Sticking the Scales On. This is the longest and most monotonous step. For this step you should once again have the sleeve on the bottle. Stand the bottle up and stick on your first scale with it's tip just touching your work surface, stick on your second scale overlapping the previous scale on one side by about half an inch, again with the tip touching the work surface, repeat until you have have gone all the way around once. To start on your second row of scales, place the first scale of this row half a scale (1 inch) to the left or right of center of the ones in the first row and overlapping from above, the tip of scales on the second row should sit in the vallieys of two scales from the first. It is up to you how much overlap you want from the row above but the more you have the more rows and therefor scales it will take to cover the bottle. Repeat with all subsequent rows working your way from bottom to top. If the thickness of your bottle changes you will need to either: increase or decrease the number of scales per row, or change the amount of sideways overlap, or both. Mine started out at nine scales per row in the thickest part, then went to eight and then 4 around the neck and cap. Folds or creases in your sleeve are pressed flat and held down as you add scales, covering any irregularities, this will also cause your sleeve to tighten slightly, so watch out for that. The section of sleeve at the neck of my bottle was quiet loose and billowy, so I used a rubber band to hold it in. When the scales got to just below the rubber band they were now holding the sleeve in and the band could be removed. Note: If you do not remove the band it will deform the sleeve when it is off the bottle. When your scales reach the top of the sleeve add an inch wide section of tape around the very top to hold the last row in place. Now go around the bottle squeezing all over to ensure all your bonds are strong. Finally test to ensure the sleeve can be removed. 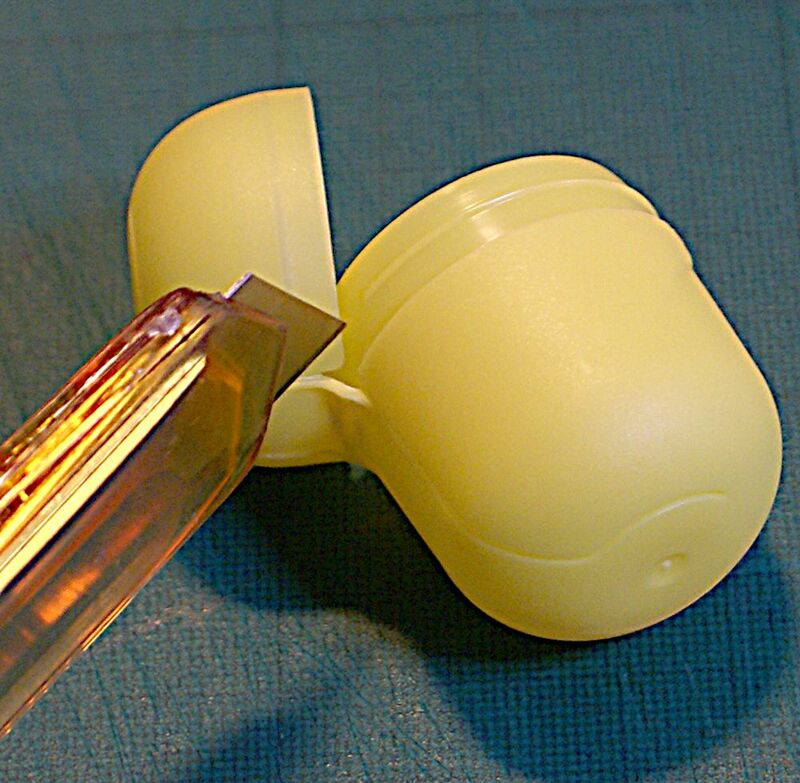 I will be using part of the Kinder egg capsule to act as a sleeve for the cap and to add a bit more shape. If you prefer you could just add scales to the cap. Start off by cutting the hinge of your capsule to make to halves, discard the smaller half (or save it for a future projects as i did) and remove any remaining hinge from the large half. Test to ensure your capsule half fits snuggly over the bottle cap and can be removed with a little effort, this is best done with the cap screwed on the bottle to add leverage. Start adding your scales in the same way as before, make sure to leave a large overhang from the cap sleeve, this will disguise where the cap starts when it is on the bottle, and covers any mistakes at the top of the bottle sleeve. Make sure not to stick the scales on to the indented section of the cap sleeve at the bottom, as it allows the cap sleeve to be pressed further down onto the cap without interfering with the bottle sleeve. This section will project past the bottom of the cap and when screwed in place and will sit between the glass and the bottle sleeve, with the overhanging cap scales sitting over the bottle scales. Screw the cap on and make sure all looks ok before proceeding. Add more rows of scales to cover most of the cap sleeve, leaving about a quater inch at the top uncovered. Cover the remainder of the cap was coved with rows of 8 small scales and topped with a 1 inch square of tape sitting evenly on 4 scales in the last row. If you would like to do the alternative method of finishing the cap follow the process about up to the *, then follow the steps bellow. A Large Bead: Any Lead bead of you choice, I went for one I thought looked a bit like an eye, It cost me 50p from a local bead shop. Glue: I will use Craft Glu Dots, they are strong but dont dry solid, so the bond wont brake if it is moved, they also work on the non glue side of duct tape. Note: I missed photos of some parts but you should still be able to follow the steps,sorry about that. Using your small scales ring the top of the cap twice, but with the scales face up, it should look like a crown. Put a thin strip of tape around to cover the join between the big and small scales. Cut a hole in the top of you kinder canister about two thirds the size of your bead, this will give it a seating point. Obviously you can do this step at the beginning if you prefer. Use two squares of tape, the size used to make the small scales, placed at 45 degrees to each other to cover the hole, press in a dimple with your finger, this gives to a surface to glue the bead to. Starting half way up your bead stick small scales round it with the tips pointing up as before, until you have covered most of the bead, test you have covered enough by placing it in place and seeing if it looks right. I used four rows of five beads. Place a small square of tape over any uncovered area at the bottom of your bead. Stick it into place using your glue. You should now have a bottle that looks similar to the one here, with a removable sleeve and invisible cap. Fill it with your favourite tipple. Give it as a gift to someone who loves dragons and fantasy. You now also have the knowledge to cover just about anything in "Dragon Skin". Why not cover a plastic bottle for your kids to take in their pack lunch? Or get a polystyrene egg form from an art shop and cover it to make "Game of Thrones" style dragon eggs. Make a duck tape pouch with "Dragon Skin" as the outer layer. Whatever you choose to do I hope you have enjoyed this 'ible and please be sure and post a photo for us to check out. An Annoyance: Sometimes the tape on the inside of the sleeve can roll over itself in small areas at the joins and stick to the bottle, this makes it harder to slide the sleeve off. Thank you so much for this instructable!! Im always looking for new way to make any sort of armour. I made some scale gauntlets, (just finished the first one.) i attached a pic. Fits like a glove. Hope to hear what you think! I agree with clintonmc, you should definitely make and instructable for these! I've been attempting to make smaller gauntlets with scales out of other materials for a renaissance fest costume and nothing has worked out so I would love to see how you made these. They look amazing! These look fantastic Stingray! What tape did you use? It really adds to the effect. I think you should right an Instructable on how to make them, I'm sure many people would be interested to see it. Thank you for posting the picture it's good to see such a great use of the ible. could you make a sleeve of a soft knit material and then follow your instructions to stop the roll of tape edges? Very nice Roan, it is all was nice to see my 'ibles being executed so well by others. The layer of tape that touches the bottle has the sticky side facing out, with the scales attached to that, so nothing actually sticks to the bottle and it can be slipped up and off. I was so excited, about the design. I made Thor sleeves doing this and it came out perfect. I did basically the same thing, but I made a Kindle case instead. you can get lots of different colored duct tape (cheap) from ebay. Glad you found it useful drkokjohn, thank you for your very kind comments, would love to see what you made using the 'ible. I used your design to help build the hands on my dragon costume. I gave you credit and linked to your page. Thanks for the idea. Great Idea and thanks for posting the photo it's always great to see how people use my ibles. Thanks for the credit too.